There has been a good deal of discussion recently about the Praise Team/Praise Band phenomenon, a phenomenon that has become a liturgical commonplace. Most of that discussion has centered around the practical issues of the expense, the placement of the instruments (front, side, back? 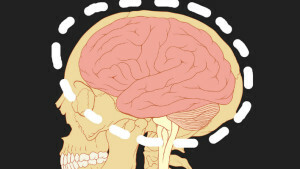 ), the adjusting of the volume, etc. Many of us regard that cost/benefit analysis of the matter to fall heavily on the “cost” side, and do not regard the practice as being worthy of the effort, expense, and other logistical headaches involved. If a student or former student were planting a church today, and if he asked me whether he should have a Praise Team/Praise Band, I would advise against it on practical grounds. Recently, however, someone asked me if I regarded the practice as biblical or unbiblical, and this provoked me to think about the matter differently. When one asks whether the practice fulfills the biblical duty, the question is framed quite differently, and I now have a provisional opinion on the question of whether the practice is biblical. Roughly twenty years ago, I began teaching the course on Presbyterian Denominational Standards at Gordon-Conwell Seminary. About a fourth of the course addressed Presbyterian polity and three-fourths addressed Presbyterian worship. Students in those days will recall that I often expressed concern about performing choirs and overly-loud organs. In each case (performing choir and overly-loud organ) my concern was the same: congregational praise is a commanded duty that can be audibly discerned; we should hear congregational praise when it is sung, and nothing else (choir, organ, marching band, bagpipe) should be permitted to obscure the thing that is commanded. Congregational praise is not the only command that can be measured by the senses. When Moses instructed the Levites to weave cherubim into the temple curtain, or to carve them on the ark of the covenant, obedience could be visually measured. One could inspect the product visually and determine that the command either had or had not been observed. Suppose the cherubim had been woven into the curtain, but out of the same blue, purple, and scarlet threads of the rest of the curtain; would this have been obedient to the command? The cherubim would have been woven in, but would have been done so in such a manner that they were invisible. I think such camouflage would have evaded the command rather than fulfilled the command. Surely, the intent of weaving the cherubim into the curtain was that the cherubim would then be seen there (as a warning not to re-enter God’s Edenic presence except by way of His appointment, since cherubim guarded the garden of Eden after the curse-banishment). Some commanded things involve the senses; we should feel the waters of baptism and taste the wine of the Supper. The incense of the Levitical priests should have produced visible smoke and an aroma that could be smelled: “And Aaron shall burn fragrant incense” (Ex. 30:7). And we should hear God’s assembled people vigorously sing His praise together. If we do not hear the audible thing commanded, arguably we have not done the thing commanded. The expression “unbiblical” is not always helpful, because it is not always clear enough to do the job. If someone denies that Christ’s death atoned for sin, such a denial is “unbiblical” in the sense that it denies the central thing the Bible teaches—that the last Adam has undone the work of the first Adam and restored us to God. But if someone affirms that Abraham Lincoln was the sixteenth President, this is “unbiblical” only in the sense that the Bible does not address the American Presidency. Suppose then, for a third example, that when a local church observes the Lord’s Supper each week, the minister reads the words of institution from one of the gospels (or from 1 Cor. 11), but then distributes Spam and Coke instead of bread and wine. Is this “unbiblical?” Well, the words of institution are surely biblical; having the meal as a part of worship is surely biblical. But is the biblical teaching fulfilled by distributing Spam and Coke? Well, not quite, because the three imperatives (“take,” “eat,” “drink”) have particular direct objects. The words of institution employ the demonstrative pronoun “this.” “Do this (τοῦτο ποιεῖτε) in remembrance of me” does not quite mean “Do anything in remembrance of me.” “This (τοῦτό) is my body” (after the clause, “he took bread”) does not mean “anything is my body.” And “this (τοῦτο, a cup filled with Passover wine) is my blood of the covenant” does not quite mean “any cup (filled with anything).” “For as often as you eat this bread (τὸν ἄρτον τοῦτον) and drink the cup (ὸ ποτήριον πίνητε)” does not mean “as often as you eat anything and drink anything.” So I think we would agree that distributing Spam and Coke during the Lord’s Supper is “unbiblical” in the sense of being “not quite biblical.” There are some biblical things about it, and some not quite biblical things about it. I regard the Praise Band (or Praise Team) as “unbiblical” in this particular sense; it is “not quite biblical,” and I would like to explain why I regard it so. To demonstrate that the Praise band is “not quite biblical” we will need the help of our friend Ann. Ann is not a theologian; she is just a good faithful Christian who happens to have been born blind. In every other way, she is a perfectly healthy person; in fact, her other senses are very well developed, as is often the case with those who are blind. But Ann is very helpful to us because her experience of the Christian worship service is entirely auditory; she doesn’t see anything, she merely hears. And the question we will ask Ann is “What do you hear?” If her answer is not the answer the Bible teaches, then what we are doing is not quite biblical. That is, if the Bible commands something, and if the something it commands is auditory in nature, then a hearer should hear the thing the Bible commands. So we turn to these considerations, with Ann’s assistance. First, does the Bible command anything regarding our assemblies on the first day of the week? Does it merely require that we not forsake assembling together (Heb. 10:24-25), but then permit us to do whatever we wish, e.g. throw Frisbees, eat hotdogs, watch the Pittsburgh Steelers, etc.? Some traditions think the Bible requires nothing of our church-meetings on the first day of the week. Some traditions simply meet because they find it helpful and convenient to do so; they regard “church” as a voluntary society, a group of like-minded people doing something together that they find helpful or encouraging, similar to community theatre or a community chorus, but more religious. For such traditions, Ann and I are silent. We have nothing to say to those who regard the Christian assembly as a voluntary society, because, by definition, if it is merely a human invention, a voluntary society, then it is answerable to no one other than those humans who invented it. But there are other traditions that regard the assembly on the first day of the week as biblical and apostolic, something the early church “devoted” itself to: “And they devoted themselves to the apostles’ teaching and fellowship, to the breaking of bread and the prayers” (Acts 2:42). For traditions that regard the church as an institution (not as a voluntary society), then that institution must do what it is instituted to do; it must “devote” itself to the purposes for which it was instituted. Working within that tradition, then, we ask whether that assembly is required to sing audible praise to God, and if so, how it is commanded to do so. That is, if an audible thing is required, then there would be an audible test of whether the required thing were done (as with the visible test of the cherubim woven into the curtain of the tabernacle). For example, if Justin Bieber showed up and sang several songs for the congregation, would this fulfill what the Scriptures require the congregation to do? Do the Scriptures merely require some musical act of any sort, or do they require a particular musical act? If the entire congregation stood up and hummed “Amazing Grace,” would this satisfy what the Scriptures teach? I suggest that the Scriptures teach three audible things about the singing of praise in the Christian assemblies: that the singing be congregational, that it be together (not necessarily unison, but together), and that it be vigorous (loud or robust). Let me first apologize for the abbreviated nature of the argument here, because I do not wish to write a book-length argument. But here is (part of) how I reason. When the New Testament authors employ Greek, I assume that they ordinarily employ it in a manner similar to the Greek Old Testament. For three centuries, the Greek Old Testament had been the Old Testament employed by the Greek-speaking Jews, and for many of them it would have been the only book with which they were familiar because “books” were rare when they were in the form of manuscripts written on papyrus or animal skin (Porter, 2000, p. 1099). Therefore, I assume that when they use the same words to describe what is done in the Christian assemblies as were used to describe what was done earlier in the pre-Christian assemblies of the Israelites that they ordinarily meant the same thing. Specifically, when Acts 2:42 says that, among the things they were “devoted” to was “prayers” (ταῖς προσευχαῖς), they probably meant the same thing by the term as was meant in the Greek Old Testament. In the Greek Old Testament, “prayer” was employed to refer both to what we would call “spoken” prayer and to what we would call “sung” prayer, or praise (Nichols, p. 33). The canonical Psalms, for instance, were sometimes referred to as “prayers.” Psalm 90, the only psalm attributed to Moses, is entitled “A Prayer of Moses (προσευχὴ τοῦ Μωυσῆ), the man of God.” Psalm 102 is entitled “A Prayer of one afflicted (προσευχὴ τῷ πτωχῷ),” even though we think of it as a Psalm/hymn. Psalm 142 is entitled “A Maskil of David when he was in the cave. A Prayer (προσευχή)”. When one of the five collections that constitute the psalter concludes at Psalm 72:20, it says, “The prayers of David (οἱ ὕμνοι Δαυιδ), the son of Jesse, are ended,” indicating that such “prayers” could also be called “hymns.” In the language of the authors of the New Testament, “prayer” and “hymn” were virtually interchangeable (as Calvin noted), so that the Psalms that Israel sang when she assembled inform Christian singing when we assemble: “Let the word of Christ dwell in you richly, teaching and admonishing one another in all wisdom, singing (ᾄδοντες) psalms and hymns and spiritual songs, with thankfulness in your hearts to God” (Col. 3:16). Note that when the “word of Christ” dwells richly in our assemblies, it does so in part by our “singing psalms and hymns and spiritual songs” that are similar to canonical psalms or hymns, though in our case they are overtly Christological (“the word of Christ”). What this means for our purposes is that traits that characterized biblical psalms/hymns/prayers would have undoubtedly characterized the early Christian psalms/hymns/prayers. This means that I regard as germane to our consideration not only the apostolic letters of the New Testament, but also the canonical psalms (and other OT hymns) before them, as well as the visions of perfected worship in the book of Revelation. So when I talk about what “the Scriptures teach” about the singing of praise in the Christian assemblies, I do not narrowly mean “what the Gospels teach,” or “what the book of Acts teaches,” or “what the Pauline letters teach,” but what the whole of Scripture teaches about singing God’s praise in Christian assemblies. It is entirely possible that some would disagree with me here, and say that we can settle the matter only by the Acts of the apostles, or only by the canonical Gospels, or only by the epistles, or only by the canonical psalms, etc. I would entertain such an argument reasonably and, I trust, charitably, but I do not embrace such a view. My understanding of tota Scriptura is that we are to account for what the entirety of Scripture teaches on a given matter. When I say that “the Scriptures” teach that congregational praise is congregational, together, and vigorous, I derive those three traits from the whole of Scripture. The first thing we learn about singing praise in the Scriptures is that it is congregational, an act of the entire assembly that gathers in God’s presence. But wait (some say), weren’t there special Levitical priests who performed praise in the Old Testament? There were indeed, but everything the Levitical priests did in the tabernacle/Temple was on behalf of the other eleven tribes. They offered sacrifices on behalf of the other eleven tribes, standing in their place as their proxy, as it were; and so they also sang praise while offering those sacrifices. But the Levitical priesthood has disappeared with the sacrifice of Christ, and all of their peculiar duties that distinguished them from the other eleven tribes disappeared also, which led the Reformers to speak about “the priesthood of believers,” an office that extends now to the entirety of the Christian church. Ps. 34:1 I will bless the LORD at all times; his praise shall continually be in my mouth. Ps. 40:3 He put a new song in my mouth, a song of praise to our God. Many will see and fear, and put their trust in the LORD. Ps. 51:15 O Lord, open thou my lips, and my mouth shall show forth thy praise. Ps. 63:3 Because thy steadfast love is better than life, my lips will praise thee. Ps. 71:8 My mouth is filled with thy praise, and with thy glory all the day. Ps. 109:30 With my mouth I will give great thanks to the LORD; I will praise him in the midst of the throng. Ps. 119:171 My lips will pour forth praise that thou dost teach me thy statutes. Ps. 145:21 My mouth will speak the praise of the LORD, and let all flesh bless his holy name for ever and ever. Prov. 27:2 Let another praise you, and not your own mouth; a stranger, and not your own lips. Hebr. 13:15 Through him then let us continually offer up a sacrifice of praise to God, that is, the fruit of lips that acknowledge his name. Ps. 9:1 I will give thanks to the LORD with my whole heart; I will tell of all thy wonderful deeds. Ps. 28:7 The LORD is my strength and my shield; in him my heart trusts; so I am helped, and my heart exults, and with my song I give thanks to him. Ps. 86:12 I give thanks to thee, O Lord my God, with my whole heart, and I will glorify thy name for ever. Ps. 119:7 I will praise thee with an upright heart, when I learn thy righteous ordinances. Psa. 5:11 But let all who take refuge in you rejoice; let them ever sing for joy, and spread your protection over them, that those who love your name may exult in you. Psa. 21:13 Be exalted, O LORD, in your strength! We will sing and praise your power. Psa. 22:3 Yet you are holy, enthroned on the praises of Israel. Psa. 22:23 You who fear the LORD, praise him! All you offspring of Jacob, glorify him, and stand in awe of him, all you offspring of Israel! Psa. 30:4 Sing praises to the LORD, O you his saints, and give thanks to his holy name. Psa. 33:1 Shout for joy in the LORD, O you righteous! Praise befits the upright. Psa. 67:3 Let the peoples praise you, O God; let all the peoples praise you! Psa. 69:34 Let heaven and earth praise him, the seas and everything that moves in them. Psa. 79:13 But we your people, the sheep of your pasture, will give thanks to you forever; from generation to generation we will recount your praise. Psa. 89:5 Let the heavens praise your wonders, O LORD, your faithfulness in the assembly of the holy ones! Psa. 95:1-2 Oh come, let us sing to the LORD; let us make a joyful noise to the rock of our salvation! Let us come into his presence with thanksgiving; let us make a joyful noise to him with songs of praise! Psa. 98:4 Make a joyful noise to the LORD, all the earth; break forth into joyous song and sing praises! Psa. 105:1-3 Oh give thanks to the LORD; call upon his name; make known his deeds among the peoples! Sing to him, sing praises to him; tell of all his wondrous works! Glory in his holy name; let the hearts of those who seek the LORD rejoice! Psa. 106:10-12 So he saved them from the hand of the foe and redeemed them from the power of the enemy. And the waters covered their adversaries; not one of them was left. Then they believed his words; they sang his praise. Psa. 115:17-18 The dead do not praise the LORD, nor do any who go down into silence. But we will bless the LORD from this time forth and forevermore. Praise the LORD! Psa. 149:1 Praise the LORD! Sing to the LORD a new song, his praise in the assembly of the godly! Psa. 150:6 Let everything that has breath praise the LORD! Praise the LORD! Rev. 19:1-6 After this I heard what seemed to be the loud voice of a great multitude in heaven, crying out, “Hallelujah! Salvation and glory and power belong to our God…Once more they cried out, ‘Hallelujah!’…And from the throne came a voice saying, “Praise our God, all you his servants, you who fear him, small and great.” Then I heard what seemed to be the voice of a great multitude, like the roar of many waters and like the sound of mighty peals of thunder, crying out, “Hallelujah! For the Lord our God the Almighty reigns. Not only does the entire assembly of God’s people declare His praise; they call on creation itself (“Let heaven and earth praise him, the seas and everything that moves in them”) to join them. Those who benefit from God’s creative and redemptive acts are those who are called to sing His praise. Very closely related is the reality that congregational praise is done together. Only one of 150 Psalms (Psa. 136) is antiphonal, where one party (probably priests) does one part and the congregation replies “His steadfast love endures forever.” The ordinary pattern is not antiphonal but unison, and the ordinary pattern does not divide the congregation into parts. The ministering Levites may well have sung the one part of this antiphonal Psalm, but the united congregation sang the other part. This is undoubtedly due to the fact that worship is essentially a dialogue between God and His people; He addresses them in word and sacrament; they reply in prayer and praise. Thus, there should ordinarily be only two “voices” in worship; the voice of God in word and sacrament and the voice of the people in prayer and praise (even if a minister speaks for the one party or the other). Therefore, it would not be right for one hundred people to gather on the first day of the week, each one podded up and each one singing something different from what the others were singing. The congregation is assembled together, to worship together, and to pray and sing together. What distinguishes corporate devotion from private devotion is precisely this united dimension. Singing together does not exclude singing harmonious (or polyphonic) parts. Singing together does not mean that the congregation must sing in unison. If a given culture develops sufficiently to sing harmonious parts, that is fine, but they should be singing the harmonious parts to the same hymn; the congregation should not be divided into sub-groups that are doing different things from one another. A certain kind of harmony is built into the very nature of the differences of voices; most females will sing the melody an octave higher than most males, for instance. This is fine, as long as they are singing these (differing) octaves together. Psa. 32:11 Be glad in the LORD, and rejoice, O righteous, and shout for joy, all you upright in heart! Psa. 33:1 Shout for joy in the LORD, O you righteous! Praise befits the upright.… 3 Sing to him a new song; play skillfully on the strings, with loud shouts. Psa. 42:4 These things I remember, as I pour out my soul: how I would go with the throng and lead them in procession to the house of God with glad shouts and songs of praise, a multitude keeping festival. Psa. 47:1 Clap your hands, all peoples! Shout to God with loud songs of joy! Psa. 71:23 My lips will shout for joy, when I sing praises to you; my soul also, which you have redeemed. Psa. 81:1 Sing aloud to God our strength; shout for joy to the God of Jacob! Psa. 95:1 Oh come, let us sing to the LORD; let us make a joyful noise to the rock of our salvation!… 2 Let us come into his presence with thanksgiving; let us make a joyful noise to him with songs of praise!…4 Make a joyful noise to the LORD, all the earth; break forth into joyous song and sing praises! Psa. 100:1 Make a joyful noise to the LORD, all the earth! Our earthly assemblies are anticipations of the heavenly/eschatological assemblies, in which the redeemed cry out songs of praise in loud, united praise. Therefore, our present assemblies should look and sound like those assemblies insofar as it is possible; we too should cry out in loud, united songs of praise. Such vocal exuberance is natural to our social nature. Nations have national anthems which they sing vigorously at appropriate occasions; British soccer fans sing the anthems of their respective teams across the field, attempting to drown out the voice of the opposing fans. Effectively, in worship, we declare robustly, publicly and unitedly our allegiance to our Creator/Redeemer, and we effectively “shout down” all opposition. But it is the congregation that does this, not a small ensemble with artificially-amplified voices. The amplification should come from the great number of redeemed voices joined together. Anyone who has been present at such services will attest to the fact that Ann’s answer is accurate. For content, she heard the same thing (Psalm 100). But in the one case, she unmistakably heard the congregation unite in singing God’s praise; whereas in the other, she wasn’t even entirely sure she heard a congregation at all. She’s sure she heard a small number of highly amplified voices, and that these voices were singing together. But the other voices were quieter and more hesitant. Why? Functionally, the Praise Team has replaced the hymnal. When churches decided to sing contemporary music, they often could not find musical scores, and/or they could not reproduce them for the congregation for legal or financial reasons. So the Praise Team would rehearse ahead of time (at least they had the musical score) and sing the material. It was hoped that the congregation would “sing along with” the Praise Team; and it often did, picking up on the song as it went along. But the congregation—even if the members can sight-read music—cannot sing as vigorously or confidently as the Praise Team, for two reasons. First, the congregation does not have the musical score, and must learn the song by ear. Second, the Praise Team often varies its instrumental or harmonic parts (and worse, its instrumental bridges) between stanzas, so that the congregation is not entirely sure exactly how each stanza will be sung. And since the Praise Team alone has rehearsed beforehand, those who operate the microphones must be sure that the Praise Team is not drowned out by the congregation because, after all, only the Praise Team actually knows what is going on. What Ann hears in the two settings is two very different things, acoustically. In one, she hears an entire congregation singing robustly together. In the other, she hears a small, highly amplified ensemble, and possibly she also hears a hesitant group of congregants singing along with them. Take the test yourself some time, and you will hear what Ann hears. For just two Sundays, close your eyes during the singing, and listen. You will hear what Ann hears—two very different things. But here’s the point and the problem: in the one case, what she hears–a congregation singing robustly together–is what is commanded; but in the other case, what she hears–an amplified small ensemble, and maybe some others following along hesitantly–is not what is commanded. The hesitance of the congregational singers is an unavoidable consequence of using a Praise Team rather than a printed (or otherwise displayed) musical score; and the drowning out of the congregation by the Praise Team is due also to the fact that the Praise Team functions as the musical score, albeit one that is heard and not seen. Some Praise Teams are worse than others, of course. Some introduce more variations between stanzas than others, and such variations create even more hesitance for the congregation: Will there be an instrumental bridge between the stanzas or not? 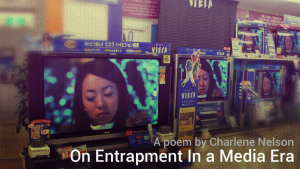 Will the same harmonies be employed in each stanza, or not? Will portions of the refrain or one of the stanzas be repeated or not? The congregation does not know—indeed cannot know—how each stanza will sound until it hears it, so the congregation sings tentatively, hesitantly, and a micro-second behind the Praise Team. The Praise Team has unwittingly become like the third grade jokester who invites you to have a seat, pointing to a chair. When you go to sit down, the jokester pulls the chair away, and you land on your backside. The Praise Team does the same thing musically; the congregation never knows (indeed, it can never know) how the Team will perform each stanza until the congregation hears it. And it can only hear it if the Praise Team is amplified to the point that it effectively overpowers the congregation. Mrs. Gordon chastised me gently several years ago for saying that I just don’t bother attempting to sing when there’s a Praise Team present. I explained why: I was tired of and embarrassed by singing the “Two-Syllable Solo.” Often the Praise Team goes straight from the first to the second stanza without an instrumental bridge; and does the same thing between the second and third stanza. I assume that they will go immediately from the third to the fourth, so I vigorously begin singing the fourth stanza only to discover that I am singing a solo; everyone else is waiting to hear when the instrumental bridge will end. Of course, I catch myself after a few syllables, and I too become like a sheep, waiting to hear what the Praise Team will do next and to follow it sheepishly when it finally decides to do whatever it is that it has decided to do. Mrs. Gordon has sung a few of her own “Two-Syllable Solos” over the last few years, so she now ordinarily adopts her husband’s practice and does not ordinarily sing when there is a Praise Band present. Today, the barrier to full, hearty congregational praise is not the lyrical score (in Latin) but the musical score (withheld from the congregation). The medieval worshipers did not know the lyrics; we do not know the music. But in each case, some smaller sub-section of the congregation performs its praise for it, graciously inviting the congregation to participate, but not actually permitting it to do so in a vigorous manner. What Ann hears is not the congregation/assembly of Jesus Christ; what she hears is a small ensemble, highly amplified. It should be evident that my concern is for the reality of an amplified ensemble overpowering the congregation; not for what you call it. But labels sometimes are indicative of the thing denoted thereby, and perhaps the problem with the label indicates a problem with the thing. 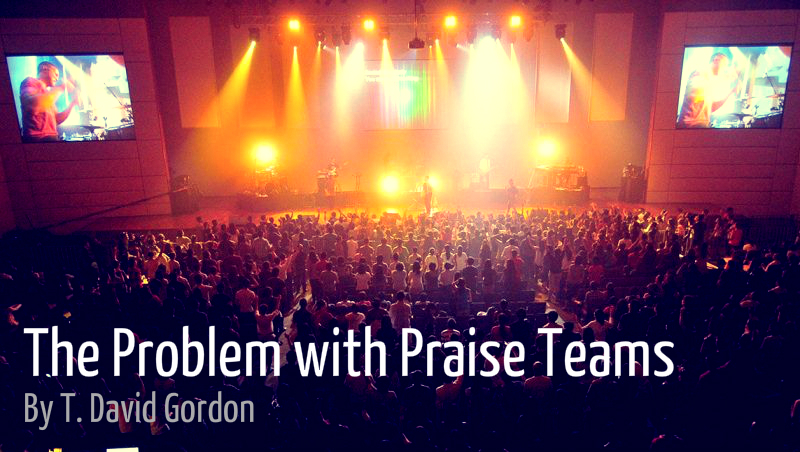 Whether we call it a “Praise Team” or a “Praise Band,” either one is problematic. If we call it a “Praise Band” the title designates a performance, and we hesitate to replace the congregation’s vocal praise with someone else’s performance thereof (even though, in fact, this is largely what the Praise Band does). If, on the other hand, we designate it a “Praise Team,” well then, what is the congregation? This may even be worse, by designating a small ensemble within the congregation as those who do the praise. When we have a “football team” on the field, we on the sidelines observe their performance, but do not play the game ourselves. Calling the Praise Team a “Praise Team” therefore also denotes something we would rather not say. But is not this difficulty of finding an appropriate label merely a reflection of the fact that the reality itself is problematic? Having surrogate praisers is simply out of accord with the teaching of Scripture, which call the entire assembly to present vigorous praise to God. Crafty Levites could have woven blue, purple, and scarlet cherubim into the tabernacle curtains so cleverly that they blended in with the curtains themselves. They could have argued that they had kept the command to weave in the cherubim, but no one would have believed their argument. If you fulfill the command to create a visible thing in such a manner that the visible thing is invisible, then you really have not fulfilled the command. And if God commands the entire assembly to sing together vigorous praise, and yet Ann does not hear such, the commanded thing is not done. Whether we “hide” the cherubim with threads that are the same color as the curtains, or whether we “hide” the assembled congregation with an amplified ensemble, in either case we have failed to do what is commanded. God is enthroned not on the praises of an amplified ensemble; he is enthroned on the “praises of Israel” (Psa. 22:3). As a final lexical consideration, I note that many defenders of the present liturgical model have coined the expression “contemporary worship music.” They did not call it “contemporary congregational praise,” and they really could not have done so, since it is evident that the current practice actually makes it difficult for the congregation to sing robustly since no musical score is provided and difficult even to hear them if they do. But the Scriptures do not command “worship music;” they command congregational praise. So even the label here is mildly misleading. If we required people to use the expression “contemporary congregational praise,” we would, in doing so, require them to do those things that enhance such congregational praise, and require them not to continue doing those things that worsen it or hide it. Brown, C. B. (2005). Singing the gospel: Lutheran hymns and the success of the reformation. Cambridge, MA: Harvard University Press. Nichols, J. H. (1968). Corporate worship in the reformed tradition. Philadelphia: Westminster. Porter, S. E. (2000). Septuagint/Greek old testament. In Craig A. Evans and Stanley E. Porter (eds.) Dictionary of new testament background. Downers Grove: InterVarsity Press. I understand many of the problems set forth in the article; however, some of the arguments seem somewhat specious. For example, the author argues that the congregation cannot sing vigorously with a praise band because they don’t have the music. Most congregations don’t sing vigorously when they do have the music (hymns). Most members of a congregation cannot read music so having music may not benefit them anyway. It seems that the assumption is made that the congregation does not know the “praise songs”. If this is the case, the praise band has failed to teach them. It is common sense that any new song has to be taught before it can be sung. One would not expect a congregation to try to vigorously sing a new praise song (or hymn) without singing it over the space of several worship services. As far as the band drowning out the congregation, this is a simple technical problem that can easily be remedied. If this problem is allowed to persist, then problems exist other than music-related ones. To address the need for the songs to have the proper substance (scriptural words), the band leader and the pastor need to have a close working relationship. If the band leader is not capable of discerning what is a proper song to use and what is not, he or she simply needs guidance from the pastor or responsible elder. Finally, one would be prompted to ask the question, “If God does not want us to use a band, or a pipe organ, or a piano in our worship services, why has he provided so many skilled musicians and composers?” If one takes a serious look at the history of church music, not only in America but world-wide, there can be no denying that God has produced, through the church, some of the most glorifying music that exists. Why would he do this and then expect us not to use it? I simply came upon this randomly, but with interest. I find the arguments presented on the matter to be manufactured, and the rationale presented as support to be without merit. The Psalms give us exhortations to praise with instruments, and I’m sure even at the earliest times when they praised with even the crudest of instruments, the situation was the same, that until everyone learned the songs and the cadences of new songs, not everyone was involved. But your complaining about the bridge of the song and not knowing when or if it would come, seems pretty empty when you flat out admitted that you by personal choice do not practice with them. GET ON BOARD, maybe it’ll teach you what you don’t know about the songs, and you won’t be singing the “two-syllable” verse. Sounds like your whole spiel was due to some personal embarrassment or other when you came in and nobody else did. Get a life, that’s not the worst thing that will ever happen to you. Unfortunately, while the sentiments and some points within this article are a valid expression, it is a hodgepodge of proof-texting, misuse or possible just complete misunderstanding of scripture and history. There is certainly a need to address the sometimes poor decision making, leadership and discretion wielded in much of today’s worship planning and leadership, but the statements in this article and the “biblical support” of the writer’s viewpoint is, well, hogwash (sorry for the bluntness). The danger in this article is that it “arms” the less-informed and easily led astray with erroneous reasons to potentially bash and ignore what is in truth a movement of God. While I agree with some commenters that the article is rather long, the author recounts important observations about the congregation’s musical role. Yes, both he and the commenters use anecdotal evidence, but note how many DO comment about volume and song form issues. If these issues are that pervasive, then the author’s point has been bolstered. And these ARE important issues. Congregations being drowned out and/or focusing on the stage show and/or unable to follow the song – which could, in turn, cause them not to participate – must happen often enough or it wouldn’t keep getting brought up. Ultimately, the church itself has to decide how they worship: sing along or listen, or both, or neither? Also, just because a congregation “can” make due with only lyrics, why not provide some music for those who CAN read it or as an option for those wishing to follow the lyrics/tone contour in their hand? As the author stated, money issues could be a culprit here, but we shouldn’t assume the entire congregation is completely musically ignorant. I have enjoyed the perspectives and opinions of those who have commented. As a praise band / team leader and a lifelong musician, I have always had such a respect for the God given talents of those I’ve shared music with, inside and outside Church walls. I’ve joined Baptist choirs, gospel quartets, played the piano, played synthesized strings, Methodist Choirs, sang Christmas songs in downtown, led community Thanksgiving services, etc. The discussion and fights between traditional and contemporary music is pretty sad… If we let the enemy invade our minds, create disdain in our hearts, than surely he is happy… And the Lord is not praised in any form at any volume. Whether it’s a quiet, contemplative accapela “Were you there?” from a 20 year old soloist with a music degree from a distinguished university, a 60 year “old good old boy” strumming his guitar singing “Amazing Grace” while sitting on the tailgate of his truck, or a praise team leading a few dozen or thousand with “Our God” at 96 Db …..does it matter? As long as the words and music glorify God, I don’t think any of us have the clarity, the right, or the need to clutter our minds with judgemental bias. Love the Lord with all your heart and your mind…. And remember no matter what style of worship you choose…. Give God the Glory. 1) A Worship Team is a karaoke band. It exists solely to elicit the involvement of the congregation. If you want to perform, go get a job as a professional musician. 99% of the time you won’t, because you’re not good enough or you’d already be one. 2) Karaoke works because everyone knows the song and what comes next in the song. Those two cool bars of 5/4 time you put in between the 3rd and 4th verses just made you a performer. See point 1). 3) If you as the supposedly musical members of the congregation can’t remember the song well enough to play it without music, there’s no way the congregation is going to be able to remember it well enough to sing it. See point 1). 4) Your job as a team member is to disappear and be invisible. If the congregation pays attention to you, they’re not paying attention to the One that deserves it. To 3): There are always songs that most everyone knows that have fallen out of common use; learn to appreciate how broad and old the tradition of hymnody is. Prefer something five or more decades old to the new. The young will have heard it in passing, and the old will carry it with welcome familiarity. ﻿I am called to serve in music through drumming. Praise bands need drummers. It is how God has asked me to worship – I didn’t decide this for myself. I see firsthand every Saturday and Sunday how my playing makes people lift their hands and encourages them to sing out in worship. It’s quite lovely. Just wanted to give you a heads up to bring your earplugs to heaven, because I’m going to be playing louder, more worshipful and more empassioned than ever in the presence of God. And I’m not alone in my call or my sentiment.